The first non-executive members of the new Animal Health and Welfare Board for England were today announced by Agriculture Minister Jim Paice. The new members are Stewart Houston, Stuart Roberts, Mark Tufnell and Tim Morris and they join chair Michael Seals in developing the Government’s strategic Animal Health and Welfare policy. “Farmers, veterinarians and animal keepers have a wealth of experience and knowledge. We are bringing them to the heart of Government to advise on the policies that affect them, and ensure good animal welfare standards. The Animal Health and Welfare Board for England brings experts from outside Government together with the Chief Veterinary Officer and civil servants to make direct policy recommendations on strategic policy affecting the health and welfare of kept animals such as farm animals, horses and pets. The announcement was made by Mr Paice during a visit to the Borderway Agri-Expo in Carlisle. Stewart Houston is Chairman of British Pig Executive (BPEX), Board Member of the Agriculture and Horticulture Development Board, and Chairman of the National Pig Association. He has been a pig producer in North Yorkshire since 1970, is Managing Director of Microware Pig Systems Ltd, and has had high level jobs in the National Farmers Union. Mr. Houston is a Non-Executive Director of the Scottish Agricultural College and has been awarded a CBE and a David Black Award for his sustained contribution to the British pig industry. Professor Tim Morris is the Director of the Department of Equine Science and Welfare at the British Horseracing Authority and was, until recently, Chair of the British Horse Industry Confederation. He is a veterinary surgeon with a PhD in livestock reproduction and has held a large number of leadership roles in veterinary professional organisations, industry bodies, animal science and welfare charities. Stuart Roberts is Agriculture and Livestock Director at Anglo Beef Processors where he has responsibility for all aspects of agriculture and livestock policy as well as sustainability. Prior to this, he was Chief Executive of the British Meat Processors Association and spent eight years within the Ministry of Agriculture, Fisheries and Food, the Food Standards Agency and the Department of Environment Food and Rural Affairs, involved with livestock policy. Mr. Roberts has a degree in Agriculture and Business and is a Nuffield Farming Scholar. He is also a Board Member of Assured Food Standards, a Liveryman of the Worshipful Company of Butchers and a partner in an organic beef and cereal farming business in Hertfordshire. Mark Tufnell runs a family farm in the Cotswolds. He is a Chartered Accountant and Tax Advisor and has a diploma in Advanced Agricultural Business Management from the Royal Agricultural College. Mr Tufnell chairs several groups including the Business and Rural Economy sub-Committee for the Country Land & Business Association (CLA) and the Audit & Risk Committee at the Three Counties Agricultural Society. He is also a former Cabinet Member for the Environment and Communities at Cotswold District Council and was previously a Secretary of State nominee on the Cotswolds Conservation Board. 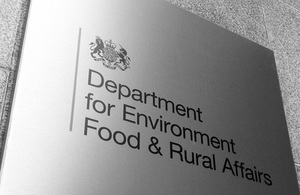 The Animal Health and Welfare Board for England was announced on 26 April 2011.